COMMENTARY — The BYU Cougars have found the enemy — and it is themselves. BYU fell victim to itself through a long list of key crucial components in last week’s beating at the hands of a rejuvenated Michigan program. The dream start to the 2015 season had a nightmare end as it closed out the first quarter of the season schedule. The Cougars, in a matter of 60 minutes, went from America’s favorite underdogs to just dogs. It’s never a good sign when watching the game to find yourself only hoping for your team to put a couple points on the board to save themselves from the dreaded shutout. BYU was taught a lesson in humility, but it seemed to be self-inflicted, from poor play-calling on all three phases of the game, (offense, defense and special teams), to terrible player execution, crucial penalties and bad field positioning. Throw in a couple of questionable calls by the refs that kept Michigan scoring drives alive early on and it was a complete fiasco from start to finish. Again, BYU had no one to blame but itself. The fact here is this: The same team that showed up in Nebraska, Boise State and UCLA did not show up to Michigan. I don’t want to start sounding like so many of the bandwagon fans who turn on the team when things go south, but this week was so bad that I have to point out the obvious. It starts from the top and works its way down to the very bottom for both the good things as well as bad. Unfortunately, BYU didn’t even make a conscious effort as a team to hold its head up and come out to compete vs. Michigan. If BYU could have put some points up on the board, Cougar nation would at least have some reasons to feel OK about the performance. At some point, it’s not all just winning, but representing yourself in the best light possible. 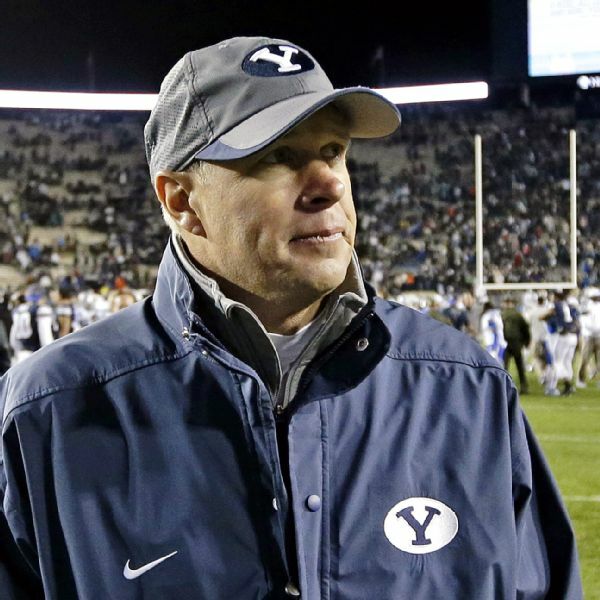 Things did not go well for Bronco Mendenhall and the Cougars against Michigan. So what really made the wheels fall off for BYU? Can we blame the tough schedule (most difficult in the nation, according to ESPN)? As an independent, BYU could schedule a very light preseason. But it’s doubtful that fans would be happy playing Weber State and UC Irvine ini the first month of the season, especially since the late-season schedule is so light. It’s possible the team was emotionally and mentally spent after the first three roller coaster games. The Wolverines had BYU’s number from the start to the finish. There was absolutely no drive or emotion from the players on either side of the ball until BYU’s defense started to show itself in parts of the second half. Granted, Michigan was just trying to run the clock out and keep BYU from coming back the whole second half, but at least the defense showed a little life. The lack of player leadership on the sideline was apparent throughout the entire game. There was no one that pulled the team together and made a real difference in at least being competitive and giving the team a chance. This is where seniors Taysom Hill and Jamaal Williams could have really lent a helping hand. Where was the fight in these Cougars? I didn’t see it. Football is a violent sport and is truly about imposing your will on others with a structured and fundamental game plan against an opponent. I saw no game plan and no fight out of BYU. Even strategically, it seemed like Michigan’s coaches knew Bronco Mendenhall’s and Robert Anae’s every move and tendency. The last time BYU was shut out was in 2003. This was actually when I was playing for BYU in my junior year. It was in a loss to Utah at home 3-0. There has been 143 games played since that shut out and I cannot remember a single game for the Cougars that was so one-sided. Shutouts are demoralizing and are huge setbacks, no matter who the opponent is. Simply said, it was a total system failure, and it was embarrassing. BYU has reached a softer side of its schedule and hopefully the Cougar players and coaches can regroup and that the program can win out with its remaining schedule. They’ll have to take each game as a new challenge and build back up some confidence for a couple of the bigger games like Missouri and Utah State on the horizon. This week, BYU faces Connecticut at home Friday night. The Huskies are currently sitting 2-2 so far this season. UConn is in the AAC (American Athletic Conference) and has only faced BYU one time (in 2014 when BYU beat the the Huskies 35-10). The odds makers have BYU favored to win for the first time this year. The Cougars are favored by 18.5 points this week. I really like BYU’s chance to finish the season strong, but with two consecutive losses they need to come back strong this week. A loss like the one to Michigan can send a weak team spiraling to oblivion. Or it can motivate a strong-willed team to try and never let that happen again. It’s time to separate the men from the boys. Blue Blood is a sports column written by Scott Young. The opinions expressed are not necessarily those of St. George News.